This does not constitute investment advice. 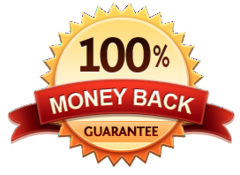 Returns mentioned herein are in no way a guarantee or promise of future returns. Mutual Fund investments are subject to market risks. Please read the offer document carefully. Top 5 Funds You Could Invest In Right Away! EXCLUSIVE: Get This Special Premium Report Virtually For FREE... Read On To Know More! Today, I am going to reveal some details of the recent chat I had with Vivek over a coffee. I did not think that a simple cup of coffee and a friendly chat will be so fruitful. As usual, the chat moved around stray topics like the latest movies to cult cinema, Augusta Westland to Rafale, Elections to Interim budget, Development to Unemployment… And so on! But we could not stick to all those, as we were out for a casual cup of coffee. While sipping his favorite Ethiopian coffee, Vivek said something which let me shocked. Something he hasn't said in years or probably ever. And honestly, I have no reason to doubt what he believes in. After all, the last time he said something like this some of his recommendations beat the market by over 80%. As I said, I was equally shocked with what Vivek's statement. It is not every day that the head of our research team is so excited. So, we thought why not make this brainchild of Vivek available to our loyal readers and subscribers like yourself. In the next five minutes, you can come to know about Top 5 Mutual Funds with high growth potential, that you may want to invest in right away. These can be very instrumental in helping you begin building the kind of wealth that ensures TRUE financial freedom. If the idea of getting instant access to these 5 funds right away excites you, then you've come just to the right place. Because I am giving away our latest report that will give you access to the Top 5 High Rewarding Equity Funds that you could invest in right away. It's called Top 5 Funds, and I want to send you access to it ABSOLUTELY FREE. I'll tell you exactly why in a moment. A large-cap oriented fund with a track-record spanning over a decade, that has established itself in the large-cap category with its consistent long term performance and has rewarded investors with superior risk-adjusted returns. The fund has not only kept risk under control, but has managed to deliver benchmark-beating returns as well. Its ability to curb the downside risk makes it an ideal fund to provide stability in ones long term portfolio. In the last 5 years, the fund has generated returns at around 20.7% CAGR. A large and mid cap fund that has turned out to be a clear winner within its category. With its dynamic performance, the fund has been consistently generating superior risk-adjusted returns for its investors over the past few years. Despite being an actively managed fund, it has kept risk under control and has consistently delivered benchmark-beating returns. Its ability to tap the market rally and curb the downside risk makes it an ideal fund for long term investors. A decade old mid-cap fund that has come to the limelight recently. The fund has not disappointed over the recent market cycles and scores well in terms of managing risk. It has delivered superior risk-adjusted returns for its investors who have stayed invested in the fund for the long term. The fund manager looks for high growth oriented stocks in the mid cap segment, but which are available at fair valuations. Being a mid-cap oriented scheme, high volatility cannot be ruled out. A multi cap fund following opportunities style of investing. The fund has performed extraordinarily well and has consistently maintained its spot in the list of top performers. It has posted a substantial margin in outperformance when compared to its peers. Though the volatility is comparable to that of few other schemes in the category, this fund scores high on risk-adjusted return and thus adds to positives that ranks the fund higher. A less popular fund that takes contrarian bets and invests in out of flavour sectors and stocks which are available at significant discount or cheap valuations. What differentiates this fund from its peers is its ability to enter stocks at right valuations and timely exit from underperforming stocks. This fund has been outperforming its benchmark by a substantial margin, while keeping volatility in check. It scores high on risk-adjusted returns and has consistently delivered superior returns for its investors who have stayed invested in the fund. These are the FIVE funds that we believe hold the best wealth-creating potential in the coming few years. Whether the market goes up or down, you need not worry. These five funds, as per our research, are well poised to garner steady and significant returns over time, regardless of what happens tomorrow. A question we take pride in answering every single time. You see, at PersonalFN, our core proposition is built around research and financial planning which is our primary business. Our highly qualified research team has been successfully helping people get financially educated and wealthy for over 19 years now. It is what makes us stand apart and probably makes us better than others. After all, we are one of the oldest in the mutual fund research space. It is our job to find good opportunities and make them available to our loyal followers. Hence, we have decided to make this available to as many people as possible. That is because we want every investor to have a fair chance at building wealth. And that is exactly why we are going to give this exclusive report for ABSOLUTELY FREE! But before we go on and tell you how you can get this report worth Rs 5,000 for Free, there is something more we would want you to know. You Are Not The Only One Losing Money! On what basis do you pick the funds you invest in? Or the worst... "Gut Feeling". Well, most of the investors depend on one of the above. And finally, they end up losing their hard earned money! Losing sleep and peace of mind. So honestly, you are not the only one losing money. Picking of funds requires a special skill set and a lot of research & analytical expertise. People spend years studying this in colleges and then in the market. How do you suppose someone who is not qualified to pick funds, can help you make any money out of them? We can only think of one reason such an arrangement could work... LUCK! If that is the plan, well then all the best to you. However, if you want to break free from the "Not happy with these returns" phenomenon, we have news for you. Top 5 Equity Funds to Invest in 2019" for FREE. Presenting 'FundSelect' Our Premium Service That Has Beaten The Market By Over 70% In A Decade. There is a reason FundSelect is our most sought after premium research service. It is one of the oldest mutual fund research services in India, with a history of 15 years. Back then in India, there was nothing that could be called an "independent mutual fund research". Most entities entering financial services business then, were either getting into stock broking, or insurance selling, or mutual fund distribution. That seemed like the easier path to take and the money to be made from commissions was enormous. But the small investor and any guidance to him for making wealth was missing. And that’s when we thought of doing something different for the gullible investors. But somewhere we were convinced that there was a genuine demand from small investors for authentic, independent and unbiased research on Indian mutual funds. Of course, the money managed by Indian mutual funds then was just around 5% of what it is today. And we knew, there were still plenty of funds to be launched that needs to be researched...and avoided in the interest of investors. That is when and why we launched "FundSelect". And So, History Was Created! The aim of this service has always been to identify the ‘right’ mutual funds that can meet your long term financial goals. That’s not all, we also recommend funds you must avoid at all cost (and there are many of these around right now). This is what we have been doing for the past 15 years, benefitting the lives of thousands of people who have been our subscribers at different points during this decade. FundSelect carries the pedigree of PersonalFN, which is amongst India’s leading mutual fund research and financial planning brand. I am obliged to PFN for educating me in management of personal finance. I have designed my MF portfolio taking guidance from PFN. I appreciate prompt responsiveness of PFN team to subscriber queries, and their approach to take onboard subscriber requests and feedback. In particular, I liked research reports for a couple of funds which clearly guide investors not to invest in spite of high returns, due to underlying risk and doubtful sustainability of returns in the long term. This differentiates PFN from other MF research services. Beating The Market By Over 70%! This is not a common occurrence! But we can proudly boast of the same. FundSelect is our premier equity mutual fund recommendation service that aims to help you discover those exclusive fund investments, out of the over 500 equity mutual funds out there in the market, which come with solid potential to make money in long run. Both coupled with a process-driven fund selection methodology, thus probably maximizing your gains over time. We believe that is the only way to invest. For FundSelect, we live by the motto: "Be steady. Be alert. Be winning." This shows in our long performance track record. Every Rs 100 invested across FundSelect recommendations since June 2003, has now grown to Rs 1,682, as against Rs 1,015 for every simultaneous investment of Rs 100 in S&P BSE 200. That’s an outperformance in return, by around 70%! The Question is, HOW DO WE DO IT? Well, every success as two things to it! The Process and the Story - We have told you the story about FundSelect. We select mutual funds on the basis of 5 variable tests, viz. Systems and Process, Market cycle performance, Asset management style, Risk-reward ratios and Performance Track Record. So, each fund recommended by PersonalFN has to go through our stringent process where they are tested on these five essential parameters. It's like taking a test on five different qualities and getting scores from a very strict teacher! And there are some stringent qualification parameters that our expert reseach team looks at before recommending any fund. The fund manager possesses decent experience and is not overloaded with multiple schemes. Moreover, the fund house should have well defined investment systems and process in place. The fund has successfully generated positive returns across market cycles, viz. bullish and bearish. It is important the fund has the ability to limit your losses during crisis. The portfolio should not be too concentrated, highly churned or low quality. It should be managed efficiently. The fund must offer adequate return for the risk incurred. It should not be putting your money to unnecessary risk. The track record of the fund in terms of generating return on investment over various time periods like 1 - year, 3-years, 5-years and so on. This matrix is specially developed by the in-house research team at PersonalFN and we believe, it’s one of the best and reliable fund selection methodologies in the industry today. And we say this with full confidence as FundSelect has been successful in identifying long-term players, with the use of this proprietary system! But that’s just our confidence on our research and systems. So you might say "All this is fine, but why should I believe you?" That is what we have been telling our readers and subscribers for years. But we are not here to make you feel more gullible. As we have said multiple times, FundSelect has been successful in identifying true long-term players. Take the case of ‘Sundaram Midcap Fund’. We identified the wealth creating potential of the fund quite early in November 2004, and recommended it to our FundSelect subscribers. Since then the funds value has grown by 1,544% and has created wealth for our subscribers. This is about 1,000% higher returns than the benchmark S&P BSE Midcap that has registered a growth of 548% in value. The funds potential has always remained intact and has never moved to our Sell, irrespective of market conditions. This also signifies the ability of our research team to form a long-term view on the fund. And there are many such funds that have been timely identified and recommended under FundSelect. Here is another example of our early picks on the fund. 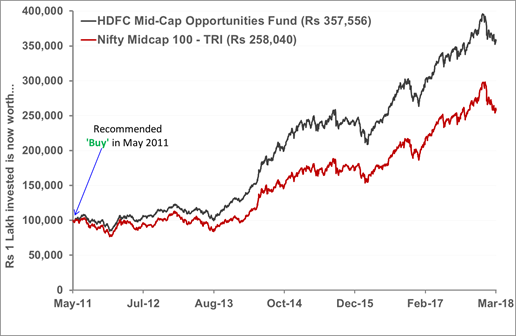 Though it took almost 4 years, for HDFC Midcap Opportunities Fund to make it to our buy list, it made a big impact in terms of performance going forward. We tested the fund in and out to be sure about its wealth creating potential before first recommending it under FundSelect in May 2011, when its size was just about Rs 1,300 crore. And within 7 years time, the fund became quite popular among investors to become the largest mid cap fund in the country, with its AUM crossing Rs 20,000 crore in December 2017. In terms of wealth creation, the fund has grown 3.5 times in about 7 years, as against 2.5 times growth in its benchmark Nifty Midcap 100 - Total Return Index. Rs 1 Lakh invested in HDFC Midcap Opportunities Fund in 2011 would have yielded Rs 3.57 Lakhs, in 6 Years 10 Months. PersonalFN has always given more importance to systems and processes, instead of brand and popularity. This can be identified from our recommendation of a fund belonging to a new and little talked about fund house - Mirae Asset Mutual Fund that had in 2011 completed just 3 years of operation in India. 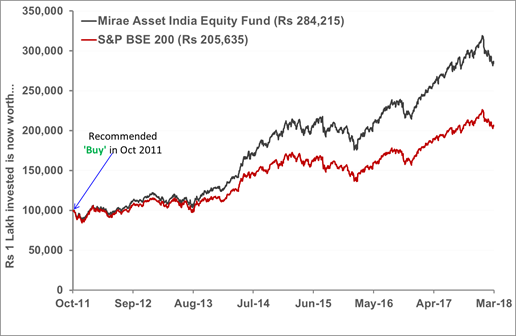 After understanding the systems and processes followed at Mirae Asset Mutual Fund, we were very clear about its fund management quality and the long term potential of its funds. Its flagship scheme, Mirae Asset India Opportunities Fund (now renamed as Mirae Asset India Equity Fund), was hardly known to investors. The fund was very small with a corpus of less than Rs 200 crore, then. This is when PersonalFN identified the early potential of this fund and recommended it to FundSelect subscribers in October 2011. The fund did not disappoint us in terms of expectation, and has consistently rewarded investors across market conditions, beating its benchmark S&P BSE 200 by a significant margin. There is a combination of expert people and process behind all our recommendations. That is why our views do not change with every small swing in the market. Yes, by now this should not be a surprise that we believe in longevity! Here is the performance of HDFC Equity Fund since the time it was recommended under FundSelect in May 2004. In the last 14 years, the fund has seen many ups and downs in terms of performance, but the fund management quality and conviction stood by its side. This helped it grow over 10 fold in terms of value. Rs 1 Lakh invested in the fund had grown to well over Rs 11 Lakh before we finally gave a Sell call on the fund. So in terms of longevity of views, FundSelect won’t disappoint you. As a rule of thumb, FundSelect will never "follow the herd". Each fund recommended under fund select goes through our stringent process, where they are tested on both quantitative as well as qualitative parameters. Only the funds that pass through this test will make it to our recommended list. We may not recommend a fund just because they are gaining popularity among distributors and investors. A major part of being a successful and smart investor is also staying away from what we call the "Portfolio Killers"
These are funds that are inconsistent and poorly managed! Like we have always asked our subscribers to stay away from inconsistent and poorly managed schemes like JM Equity Fund. Over the last 10 years, rather 20 years, the fund has significantly underperformed its benchmark as well as most of its peers. FundSelect attempted to save its subscribers from entering a worthless fund. The fund that became investor's favourite during the infrastructure and capital boom in 2007. Its AUM doubled, rather tripled within months, in the year 2007. Unfortunately, hype doesn't sell for long in finance. Many investors in this fund found themselves on the back foot, when the rally in the infrastructure came to a break during the 2008 subprime crisis. Notably many stocks in this sector have not yet recovered and so has the fund. But we do not hide them. We believe knowing your weaknesses is your biggest strength. Some of the funds recommended under FundSelect, did not meet our expectations. Moreover, we got the timing wrong. 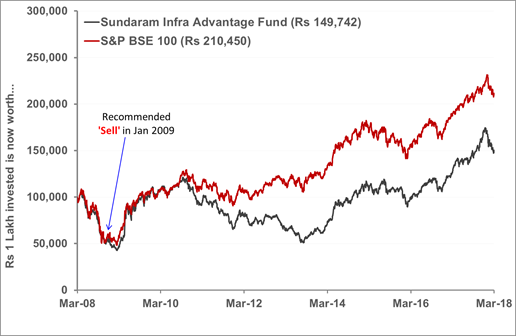 In the first phase (between April 2005 to June 2007), our recommended Sundaram Select Focus, performed nearly in line with the benchmark, while underperformed many of its peers. We got impatient with the performance and gave a Sell call on the fund. Within next few months, the fund entered its first leg of outperformance, and the subscribers who acted on our recommendation missed the opportunity. Though it didn't last for long. In August 2008, we gave the fund another chance. But this time it completely disappointed on the performance front. Despite giving it, well over two good years, the fund failed to make much impact and turned out to be one of our poor recommendations. 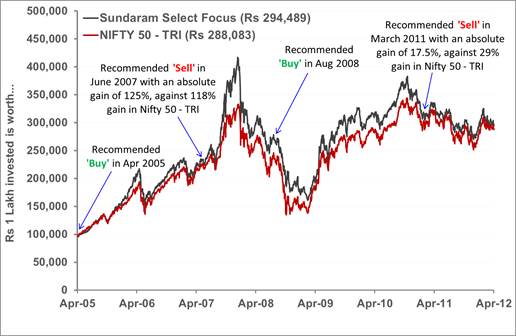 In March 2011, we finally gave a Sell call on Sundaram Select Focus. Something similar happened with Principal Growth Fund. 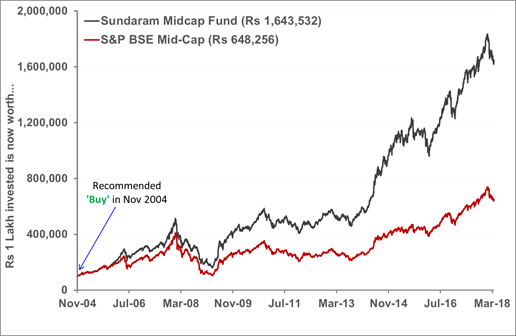 Though Principal Growth Fund made around 125% gain in 3 years post our recommendation in February 2005, it did underperform the benchmark S&P BSE 200 by about 27 percent point. With the change in view on the fund, it was recommended a Sell in February 2008. 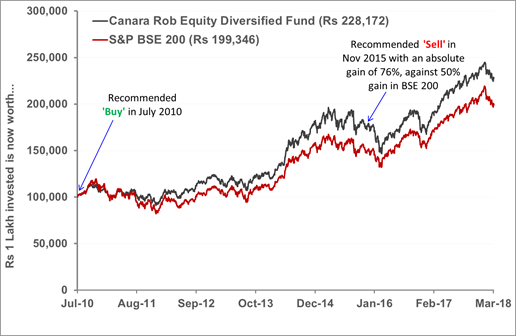 Canara Robeco Equity Diversified Fund was yet another scheme recommended under FundSelect in July 2010, that didn’t go down well as per our expectation in terms of returns. Moreover, few quick changes in fund management further affected the performance. 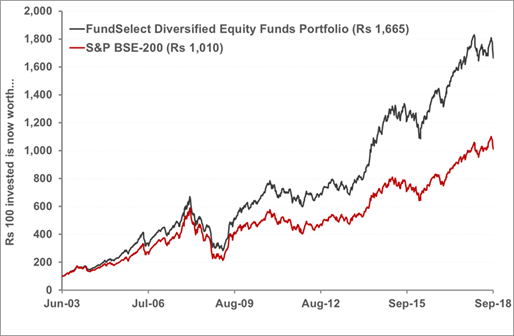 Though it outperformed the S&P BSE 200 index over 5 years’ time, it trailed many of its category peers. In November 2015, we asked our subscribers to exit the fund, while it made 76% absolute gain in a little over 5 years’ time. So, we are not infallible, to be honest. is a whopping 74 percent! You see, seven out of ten FundSelect recommendations have made solid investment gains for the investors. Alternatively, it can be safely said that even if you happen to underperform or incur slight losses by chance, you will be more than compensated for it by the gains from other funds that you invest in. Our fund recommendations tend to beat the market by a significant margin over long time periods. Once you subscribe to FundSelect, you will get instant access to potentially the best mutual funds in terms of returns they offer and thus strengthen your investment portfolio in future. I was reviewing my portfolio today. I am happy to note that all my investments have outperformed market both in down as well as up market condition. The recommendations of PersonalFN are unbiased and generally have a long term views suitable for common investor like me. When I look back, the timely advise and assurances of PFN, quite contrary to experts on TV during the last years downturn not only saved me from huge loss, it helped to maximise my return in the cycle. I once again thank you all in PersonalFN for educating common investors and unbiased advice. 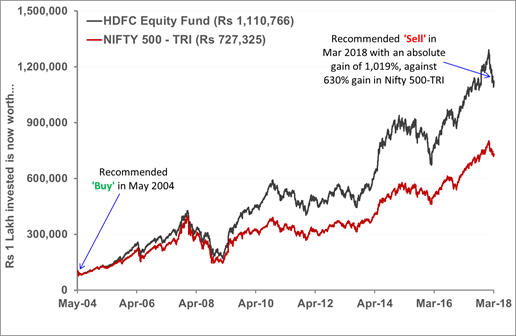 Earn Market Beating Returns - Our recommendations under FundSelect have beaten the BSE-200 index returns by over 70% in the last 15 years, and we are working hard to ensure that the performance continues in the future as well! Become a Savvy And Confident Investor - Through FundSelect, we aim to guide and educate you about the fundamentals of successful money management and the various strategies and core philosophy behind mutual fund investments. This will help you evolve into a smarter investor who can then make even better investing decisions. Identify Optimum Funds For Your Portfolio - We are not just sending you fund recommendations. Through our regular Buy, Sell or Hold recommendations, we guide you to build an potentially optimum fund portfolio suited to your goals and objectives. All these funds pass through our solid research process, undergoing strict selection process including both qualitative and quantitative parameters. Moreover, as a member of FundSelect you also get access to fund recommendations across various investment styles and market caps - including large cap, midcap, multi cap, value-oriented and growth oriented. All this will help you build the portfolio that suits you best! Save On Extra Commissions And Fees - Rule of the thumb, as an investor, is not to waste money. Thus, don't splurge your returns on high extra commissions and unnecessary fees. Save thousands of rupees just by selecting the right fund that cost you less. And trust us on this...over longer periods of time, the impact is even higher! Keep A Close Watch On Your Investments - Forgetting about your investments once you have put your money in it is one of the most serious mistakes an investor can make. And that's where our regular performance updates on our fund recommendations is going to be of immense help to you. It will help you keep a close watch on your fund investments. Employ Allocation of Your Investments - Asset allocation is a key factor in optimizing your investment portfolio according to your goals and objectives and thus gain higher returns over time. With our regular updates on the ever-changing market conditions and the promising funds in the current market, you will be able to maximize your gains and keep your risk exposure at tolerant levels - keeping in line with your long-term investment targets. Save Time and Energy - We, at PersonalFN, make sure to make the investment process as seamless and tension-free as possible. Simplify your life...Save your precious time and energy with readymade information available at your fingertips every month! All you can do is follow the recommendations diligently and build your portfolio. It doesn't get much easier than this. Yes... Over and above the ones listed, there is one more reason. We told you about this exclusive report earlier and what all it contains. Now here is the key to get it for FREE! If you become a member of FundSelect right now, you will get our exclusive report on "5 Undiscovered Equity Funds With High Potential", Absolutely FREE! Mind you this report is worth Rs 5,000, but you will not have to pay anything for it. FundSelect is an all-purpose equity mutual fund recommendation service that helps you to build wealth over the long-term in the easy going and most certain way as possible. Top 5 Equity Funds you could invest in right away. The value that you get makes up for such an insignificant price to pay. Not to mention the fact that you can potentially make a double digit portfolio return with that meager annual cost. The Annual cost is Rs 5,000. Under the special "Get On-Board Offer", you can get access to FundSelect for a year at just Rs 2,950! Now, given the potential of FundSelect and the exclusive report you will get FREE, you should not waste a second more. Are you seriously still thinking? But if you still are in double minds, here is a way to clear that doubt. You Are Getting It All, Virtually FREE! There's much more for you. We, believe in empowering you as an investor in making the PERFECT investment decisions. And for that, we have included a few goodies along with the package as well. Isn’t it better to learn directly from our research team instead of reading a guide? Of course, it is. That’s where our exclusive e-learning course comes in. Focused on "How to become your own financial planner" in this course you can learn the ins and outs of personal finance management. Composed of TWENTY-FOUR videos coming in eight modules, this comprehensive Money Simplified e-course will help you to gain understanding into the complicated world of finance. This exclusive e-Course is a 5 Hour study, spread over 3 weeks, detail the ins and outs of every possible topic related to your personal finance, starting from budgeting to planning your life goals; from insurance planning to estate planning. ...not be in the dark anymore. ...not blindly put your money in the hands of someone else. The good news is, this exclusive course is available to you at no charge at all! As a FundSelect subscriber, you get this exclusive course worth Rs 5,000 Absolutely Free — at no extra cost at all. Inside this latest guide, we have attempted to cover almost ALL the crucial questions you might have about mutual fund investing. And we are quite sure that these questions, while unknown to most rookie investors, might baffle even the experienced ones. Are you a mutual fund investor? 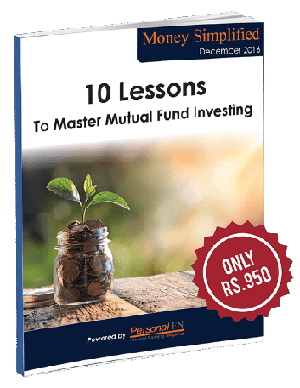 Then, this guide is going to be a treat for you, whether you are just starting to invest in mutual funds or have been doing so for the last 10 years. How You Can Judge If Your Fund Manager Is A Trader? What Are The 3 Vital Points That Make For A Superstar Fund? What Are The Myths About Dividends Declared By Mutual Funds? Should You Invest In A Mutual Fund Scheme Looking At Its NAV? How You Can Manage Short-Term Liquidity? As a FundSelect subscriber, we want you to make the right decisions...always. That comes with complete knowledge and understanding of the science and art of financial planning. Retirement is a big part of everyone’s lives. What happens after you stop earning? How will you sustain your current lifestyle? The costs are rising day by day. How will you meet your daily expenses, those that you can’t do without, which are absolute necessities? Your medical expenses, your food, your housing rent (if it applies) and so on. That’s why you need our special Retirement Guide within your reach. 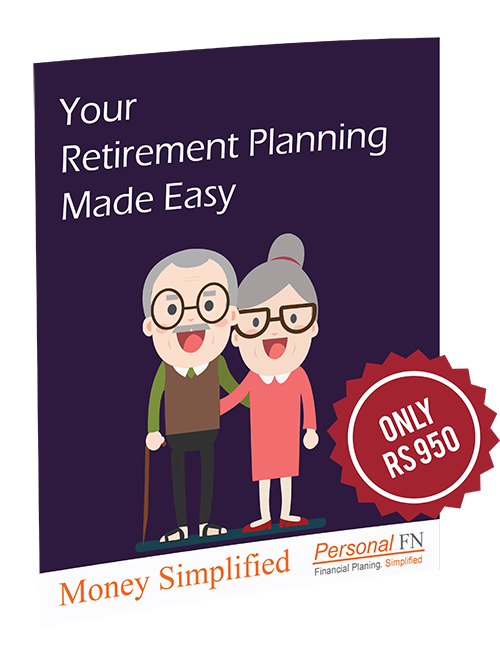 It will tell you how to plan your finances in the most appropriate way to ensure a happy and blissful retired life. This guide will show you the most optimum way to meet your retirement needs so that you could really LIVE UP the best days of your life. But for that, the first step is to know how to invest properly. Your retirement starts with a proper investment strategy. And that starts now itself. Should you invest in equity at any age? Is debt a ‘safer’ option of investment? Do you need to put some money into gold? What should be the proper asset allocation strategy? How much risk can you bear as an investor? In this awesome guide, we are going to talk about the most intricate investment related questions, and whether you are a beginner or an advanced investor, you will find something worthwhile in it, for you. In this guide, we have focused solely on how to maximize your wealth creation with prudent investment strategies that you can put to use right away. In other words, if you are an investor, this is a MUST Have Guide for you. But investment without adequate insurance is always going to be futile. You see, insurance is always a confusing topic for any average investor. Should you take a health insurance? How to choose the suitable one for you? Is a life insurance necessary, absolutely? All these questions haunt you time and again. To add to that, your friends and relatives, with their never-stopping advice, confuse you even more? Our Insurance Guide would help you put a stop to that. In this supremely valuable guide, the above questions are answered in a layman’s language, and also, in high detail that suits any average investor like YOU. So you see, you get a host of benefits along with your subscription to ‘FundSelect’. The good thing is, you don't have to pay anything extra for it. You get all of it — Absolutely Free! Now if you calculate the cost of these free bonuses, you can consider your FundSelect subscription virtually FREE. Now to forget the potential the service, the exclusive report and the free bonuses hold. You got to act fast. The benefits are huge, that you cannot afford to miss. As a FundSelect subscriber, we will guide you to make smart investments in mutual funds, and thus pick solid funds for your family's future needs and your retirement. Potentially the "best of the best" mutual funds, coupled with periodical performance reports...everything that will make your investment process much simpler and sure for you! But all this is possible when you give it a try. 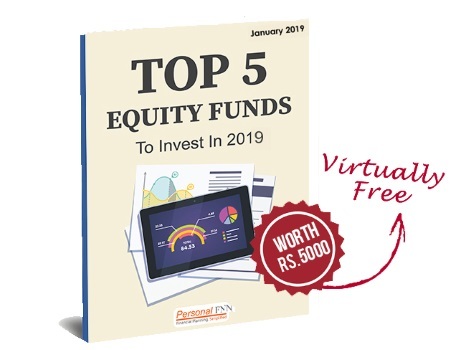 FREE instant access to our Exclusive report "Top 5 Equity Funds to Invest in 2019"
12 FundSelect issues per year. 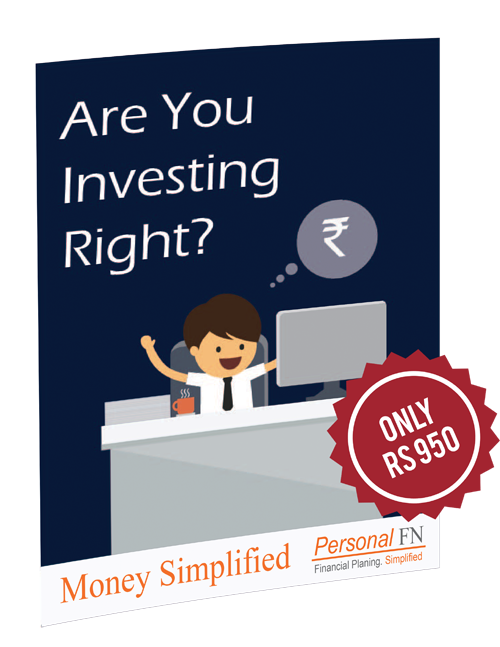 Free special Guide - Are You Investing Right? 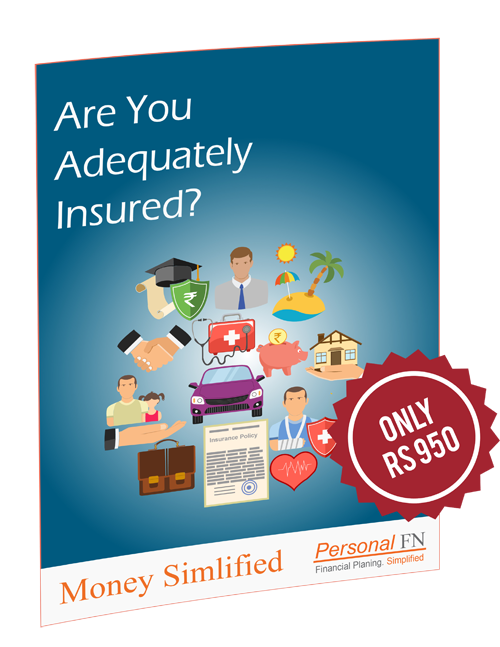 Free special Guide - Are You Adequately Insured? ...Because your subscription to FundSelect will be covered under our 30-Days - Full Money-Back policy. You can enjoy a 30-days trial with a full refund guarantee. Get complete access to all our past recommendations as well as our current recommendations under FundSelect for a month. Just let us know before the 31st day of your subscription and we'll refund the entire fee you paid. The best part is, you will still get to keep all the free bonuses and the exclusive report. That is how much we trust our services! They are yours...no questions asked. It will take only a few minutes of your time and you will be well on your path to achieving your financial goals and objectives. And we really want to. Here is where you start your journey to wealth building as a Smart, Informed and Financially educated investor. P.S. We are not sure how long we will be able to keep this offer open. Click here to avail a discount of over 40% on your subscription fee for FundSelect. Hurry today! P.P.S. Be a smart fund investor today and ensure that you choose potentially the "best of the best" funds out there. Be a FundSelect subscriber right now. P.P.P.S. Sign up for FundSelect today and you will have 30 full days to decide whether or not you want to pay for this invaluable service. If not, let us know any time during that period, and you'll receive a full refund - no questions asked. That's a promise!